The Cool House: Cake or pity? Houseblogs.net is having a Home for the Holidays Contest, with a real live prize, so I was flipping through my photo files to get inspiration for this year's holiday decorations when I happened upon this gem from our first end-of-year holiday at The Cool House back in 2004. No, a two year old did not produce this monstrosity, I did it all by myself. What's worse, I used a kit. Deeply, deeply sad. The houseblogs competition ends Wednesday November 19 2008, so get yourself over there quick if you want to enter. Me? I'm off to hang my head in shame. Me make a model of my house? Way beyond my skill set. On the other hand perhaps you could add a new line of house plates or models to your business? You know? 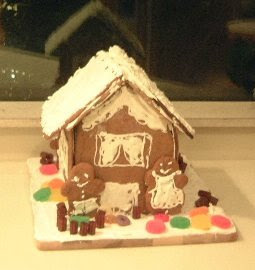 I've never made a gingerbread house before. Not ever. Maybe I'll take round rabbit's idea and try one of The Box House. How hard can it be to make a shoebox shaped gingerbread house?